I need to come clean about my love of Apple products as I feel both extreme pleasure and a sense of responsibility for what we, as a society, have allowed to happen. I played a part in this since I have visited the Apple Campus to learn how to bring devices to our school. I attended the MacWorld Expo in January 2007 when Steve Jobs introduced the iPhone. These were glorious times with so much promise for the future. We would be able to move computer use from a destination room to being available when needed. Why then did we end up where we are today? Web filters, apps to monitor usage and destinations, apps to turn off other apps, and the list grows each day. We are on the cusp of great advances with machine learning allowing us to talk to our devices to get answers to on the spot questions. Information is no longer scarce and yet many classes and schools act as if it is. Our schools should be different with all of the devices we have added to them. For the most part we have underutilized the power of the devices but instead worked hard at restricting what they could bring to our learning. I am a participant in this movement and want to own my share of responsibility, but not more than my share. I gave a talk to the sixth grade yesterday about making wise choices with the devices we give them. 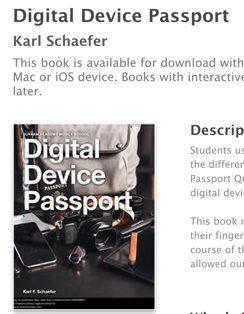 I write a book that is on all of the devices to support what I think is important for our learning community. I start with the usual acceptable use and what to do and what not to do. I dislike this part of my role but do it as I must to get to the next part of my role. That is to be a role model for how to balance the devices in our lives. Granted, today I turn 61 so I am long past the age of my students, but I think I remain relevant. The students are amazed that I do not own one of the smartphones that I saw introduced in 2007. I do not like talking on the phone and frankly think the costs of the device and the contracts for service are too high. I have a burner phone for those I love to contact me if needed. My school supplies me with all sorts of devices so I have everything that I need. I live on a farm so I now have 3.5Mbps DSL which is fast enough to do most things but not all things. I have watched as my children and grandchildren have been overtaken by the devices they bring to the farm when they visit. The woods on the farm does not call them like it used to when we looked for the fairy village as the iPad or TV has more draw. So with this in mind I wanted to shake up my presentation to the students which is why I asked these questions and shared these resources. Maybe you will find them useful. Question: How many of you have an Instagram account? Response: That is amazing since none of you are 13. I do know that you are all capable of lying to get what you want since everyone has to be 13 to use the good stuff on the internet. I discuss a bit about COPPA. Advice: If the first thing you have to do to get something you want is to lie, you probably should reconsider if you really want it more then your integrity. This allows us to discuss how humans will do many things to get what they want and lying is sometimes the least problematic action. I then shared these resources so they could understand why they “wanted” and were willing to lie to get it as I think this is important information so they do not internalize that they are bad people. I love Tristan’s TED talk and showed the first 17 minutes. I also like the work done by Time Well Spent.